This week was apparently the week of telling people at work. I had told my manager last week and let her know it was ok if she told other people, because I've been remarkably shy and awkward about telling people myself. So she told our director, I managed to tell one coworker on my own, and then another of my coworkers guessed that I was pregnant, which marked my first "are you pregnant or just gaining weight?" comment ;) Despite having a ton of maternity clothes in my closet now, I've only worn one shirt and one pair of pants so far, since I'm not big enough to really warrant wearing them all the time yet. 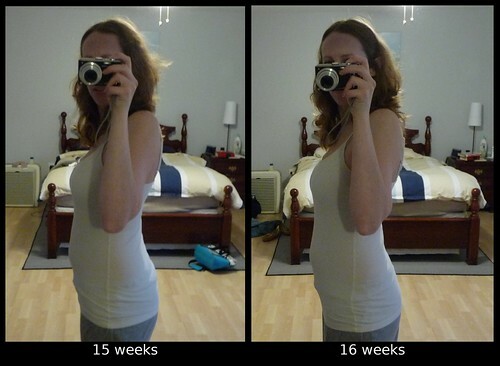 But then my regular clothes don't really fit right now either, so I cleared out all of my old shirts that were either too short or too tight so I'd stop getting frustrated by trying to wear them, and the remaining pre-maternity shirts should last me for a little while yet. I'm refusing to get the Bella band or any of the other bands that serve as the "between sizes" fix so I could keep wearing my regular pants longer, since hearing that other people felt like "a stuffed sausage" in them makes me think that would not go well with how irritated I get when I feel constricted around my waist. So instead I finally tried the hairband trick, which worked like a charm! I just happened to buy a new pack of hairbands recently, which just happened to have colors that match perfectly with all of my work pants, so using that instead of the regular buttons should bridge the gap until my maternity work pants start fitting better. As far as symptoms go this week, the main one was more RLP, since I felt some discomfort just about every day this week. The horrible sleep continues, although this week I actually took one of the maybe two naps I've taken yet this pregnancy. Given how exhausted I am every morning when I first wake up, I would have expected to be taking a lot more naps, but I usually do pretty well throughout the day (which is surprising, seeing as how before I could barely stay awake in the afternoons without my daily Mountain Dew), and then I worry that taking a nap after work would mess up my sleeping even more. I also went out to see Rudy for probably the last time in a while. I just brushed him, gave him his apple, and tried to take in as much of the horsey essence as I could (smell, sight, etc), just in case this really does mark the end of my riding days. Unfortunately, it was way too cold out to linger though, so I just gave him a few scratches and last hugs, and he actually hugged me back by curling his neck around me, which I like to think shows that he knew what was going on. I sent an email to his owner a couple days later to thank him profusely for letting me ride Rudy the last three years, and got his permission to come out whenever I wanted to see Rudy again. It will probably be several months before I might do that, though, since it's just too cold out right now, and I also purposely scheduled my pre-natal yoga classes for exactly when my normal horse time was. I figured I would have issues with wrapping up the horse stuff so I thought scheduling my classes then would force the issue, which is exactly what happened, since last week was the last chance I really had to see Rudy and tell his owner, since yoga starts this weekend.